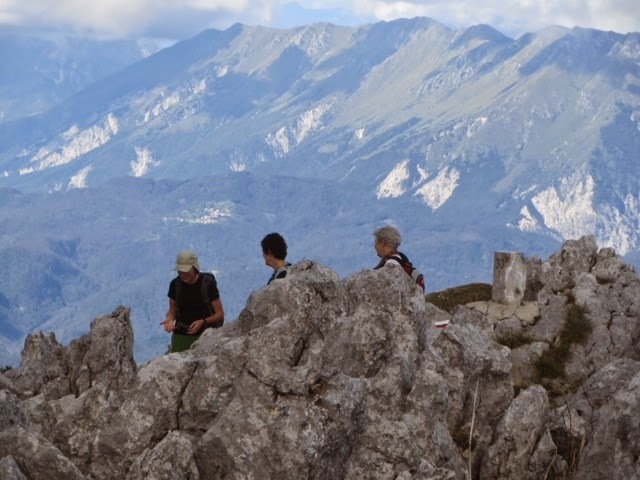 On a clear sunny day we departed Kobarid by vehicle for 1hour drive to the start oh our 6 hour hike. The narrow road winding up the mountain provided us with amazing views of the mountains. 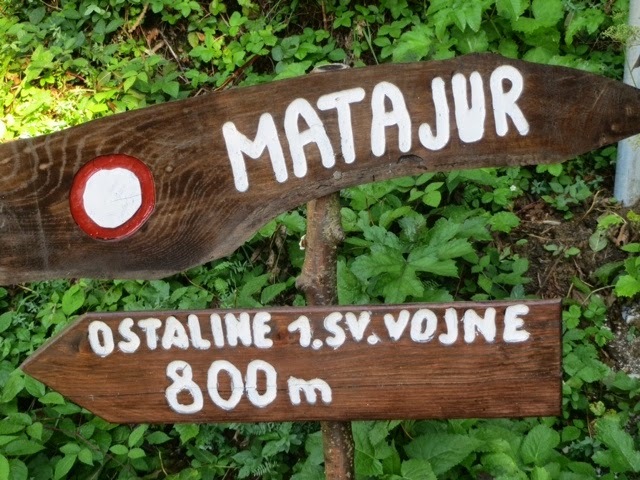 We stopped at a small settlement of only a few houses and farms to begin our hike. 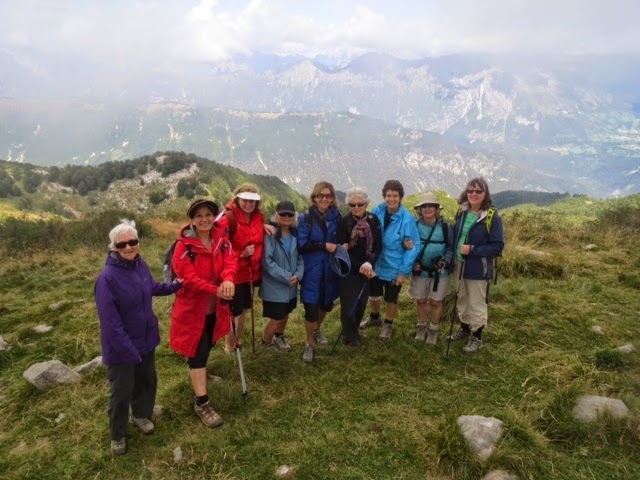 We climbed steadily on a rough but well designated path, through beautiful woods and pastures. Fortunately we were protected from the sun by dense pine, the light filtering through the pine trees forming a caladascope of colour was amazing. It was tuff going sometimes clambering over sharp rocks, and stepping into the boggy ground. 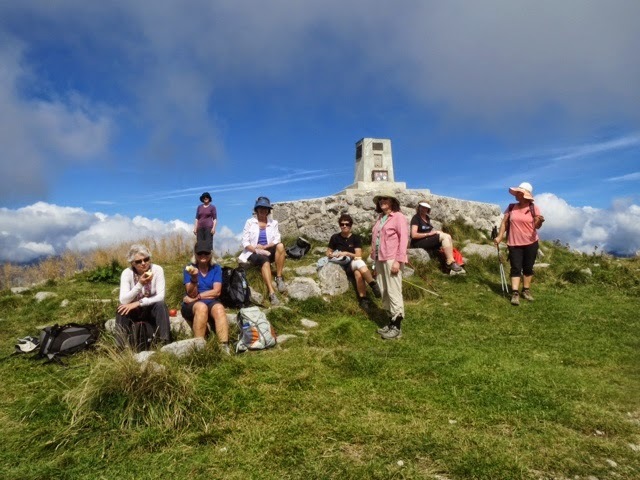 The group were strong and determined to reach the summit, and the border between Slovenia and Italy at Mount Matajur (1648m). 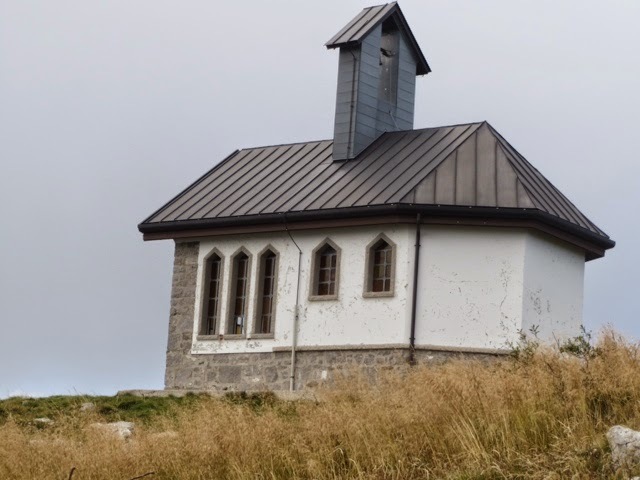 It took us just under 4 hours to reach the small church at the lookout which gave us fabulous views to the mountains of Slovenia and Italy and down to the coast near Trieste in Italy. 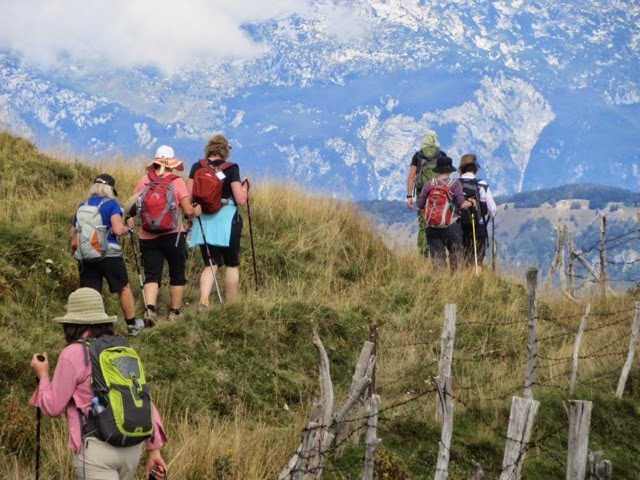 Even though we had several short snack stops on the way, by the time we reached the summit we were a group of very hungry hikers. Where else would you want to have a picnic lunch! 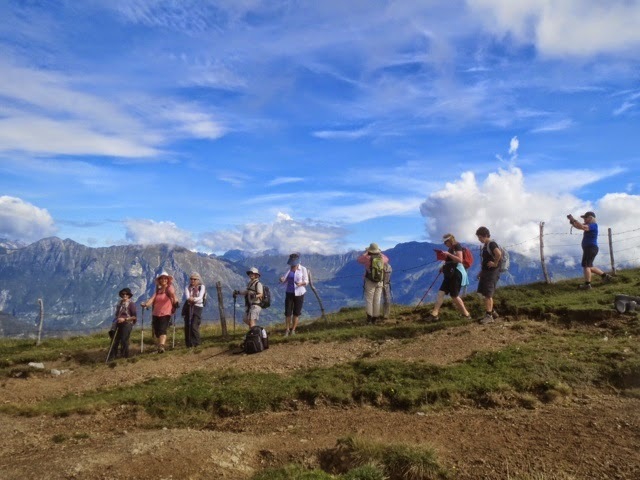 A short 200 mtre descent through Alpine pastures ending our walk at a mountain refuge, where we regrouped with two of our fellow hikers who elected not to hike but take the vehicle. One of the pluses of this trip is having a vehicle at all times at our disposal. 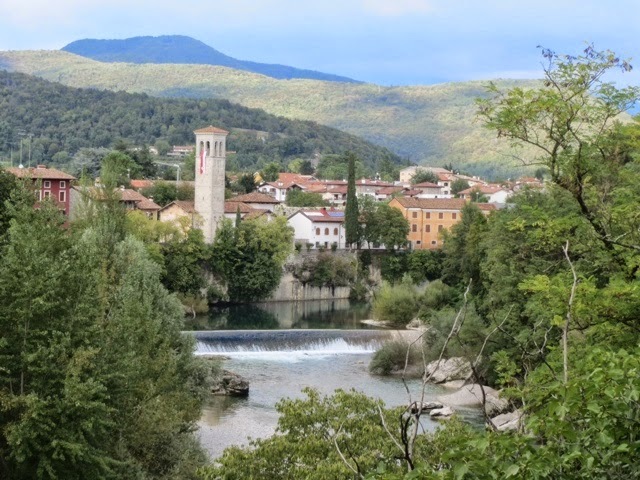 At the refuge we enjoyed a great cappuccino, before driving a short distance to have a short visit to the Unesco World Heritage city of Cividale di Friuli. 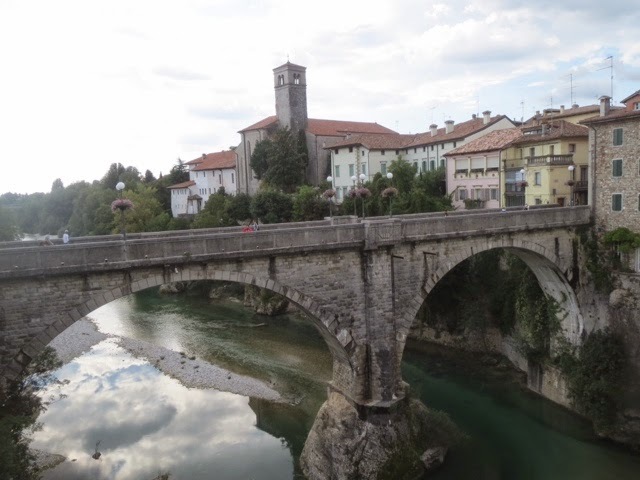 Archaelogical finds dating back top Palaeolithic and the Iron Age revealed that the town of Cividale Di Fruili had actually been inhabited since prehistory. The town reeked in history, and consisted of remarkable monuments and historical buildings. Walking through the quiet narrow cobbled streets it was easy to picture what it was like years ago. Ice creams from a local shop for everyone and we were on our way to Gorizia, situated close the the border of Italy and Slovenia, 40% of the population of this city is inhabited by Slovenians. Here we will stay for the next 3 nights in a 4 star hotel situated in the centre of the city.